Bondi Beach's only purpose built hostel, operating since 1996. Located on cafe & bar lined Hall Street, right in the centre of Bondi Beach, just 20 minutes from the airport & the City. 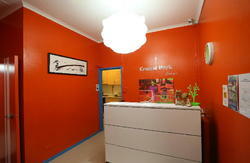 We offer clean, safe, modern and fun accommodation. We have dorms, doubles, twins, triples & family rooms. When you stay at Surfside you get free tea, coffee and breakfast plus free use of our surfboards, body boards, roller blades, snorkels & masks and fishing rods! Table tennis and a basketball court are also available for you! Awesome! Not only do our services include internet & WiFi, we can also help you with airport shuttles, getting a tax file number, getting bank accounts ready for your arrival, mobile phones, sim recharges/credit, power adapters plus much more. If you book the 14 bed mixed dorm you will be housed at either Surfside Bondi Beach or Surfside Coogee Beach. You will receive a confirmation email advising which property you will be housed at. We really look forward to making your stay a great one! 3. Take 400 bus from bay 34 (international airport) or u-turn pick up point (domestic airport) via Bondi Junction and on to Bondi Beach. Jump off when you see the ocean or Hall St on your right. We are located at 35a Hall St opposite post office. Take subway train from platform 24 to Bondi Junction & follow signs for Bondi Beach Buses. Take the 380 bus all the way to Bondi Beach. Jump off when you see the ocean or Hall St on your left. We are located at 35a Hall St opposite post office. Take the 380 bus all the way to Bondi Beach. Jump off when you see the ocean or Hall St on your left. We are located at 35a Hall St opposite post office. Follow any road into the city from the west, use Cross City Tunnel & Eastern Distributor. Take Bondi Exit to reach Moore Park Road which will carry you to Oxford Street & on to Bondi Junction. Bypass Bondi Junction, take 2nd exit to Bondi Road. Bondi Road becomes Campbell Parade when you see the beach. Take a left turn onto Hall Street at first set of lights after the roundabout. We are located on the right 50 metres down Hall Street opposite the Post Office. Follow any road into the city crossing the Sydney Harbour Bridge or Sydney Harbour Tunnel, stay on Eastern Distributor. Take Bondi Exit to reach Moore Park Road which will carry you to Oxford Street & on to Bondi Junction. Bypass Bondi Junction, take 2nd exit to Bondi Road. Bondi Road becomes Campbell Parade when you see the beach. Take a left turn onto Hall Street at first set of lights after the roundabout. We are located on the right 50 metres down Hall Street opposite the Post Office. Follow any road past Airports along Southern Cross Drive, (do not enter Eastern Distributor), stay in left lanes, through lights, past VW garage, onto next set of traffic lights where you turn right in Dacey Avenue. Take the first left turn onto Anzac Parade. Go straight through next set of lights, taking a right turn onto Moore Park Road which will carry you to Oxford Street & on to Bondi Junction. Bypass Bondi Junction, take 2nd exit to Bondi Road. Bondi Road becomes Campbell Parade when you see the beach. Take a left turn onto Hall Street at first set of lights after the roundabout. We are located on the right 50 metres down Hall Street opposite the Post Office.